On Monday, we published our second Philadelphia Eagles-only mock draft of the offseason. Today we'll take a peek around at some of the national guys and see who they have going to the Birds at 25th overall. 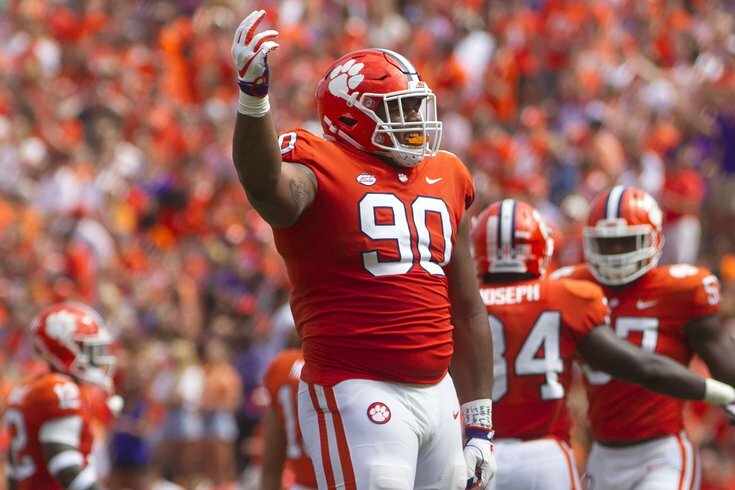 Spoiler: There's a whole lot of Clemson DT Dexter Lawrence. Eagles 2019 draft: Trade up, trade back, or stay put? The Eagles have joined the ranks of the NFL elite by investing heavily in the offensive and defensive lines. Lawrence is a rugged nose tackle with the size and strength to erase runs between the guards while also collapsing the pocket with bull rushes on passing downs. #JimmySays: Lawrence is a great run stuffer, but 3.5 sacks the last two seasons just isn't doing it for me in the first round. While there's maybe some logic in bolstering the run D in a division with Ezekiel Elliott and Saquon Barkley, drafting a run stuffing specialist in the first round is a bad use of resources, in my view, especially when there should be other defensive linemen available who can affect the quarterback. Haloti Ngata is due to hit the market this offseason, and will Timmy Jernigan be back in 2019? There could be an opening or two at DT, which would clear the way for Lawrence, who flashes the ability to manhandle opponents. #JimmySays: Interestingly, Zierlein has Ed Oliver going 29th to the Chargers. I'd take Oliver over Lawrence all day. #JimmySays: Guys, you can replace a situational run stuffer in the third week of free agency. You don't need to do that in the first round of the draft. Also, the Eagles may already have their Ngata replacement in Treyvon Hester, who outplayed Ngata last season. It's no secret that the Eagles want a cornerback, but this is some really, really good value. Put Lawrence next to Fletcher Cox and let those two plug the middle of a line that was in the bottom third in rush defense this season. #JimmySays: Oh my God, seriously? Still with Dexter Lawrence? Also, how is it "no secret that the Eagles want a cornerback?" Somewhat of a fall for Metcalf, but the neck injury and his lack of ability to run a full route tree are the reasons. The Eagles could be interested in more receiving weapons for Carson Wentz. Philadelphia gets Kansas City's third in this deal. #JimmySays: To note, Trapasso has the Eagles trading back with the Chiefs, which I don't see, since as the Eagles already have 9 picks, and will have extra compensatory picks in 2020 as well. The player is intriguing. Metcalf has No. 1 WR potential, though his production in college wasn't great. Willis didn't attend the Senior Bowl but he remains one of the best defensive tackles in a ridiculously deep class of them. His ability to wreak havoc in the backfield will upgrade an Eagles unit that ranked 26th in pressuring the quarterback. #JimmySays: 26th in pressuring the quarterback? In what useless metric were the Eagles 26th in pressuring the quarterback? That makes no sense. Anyway, the position here is fine, and I like Willis, but I'd like him a lot more in round 3. The Eagles have an extra second-round pick, and that gives them the ammo to hop into the top 15 and get the top cornerback on the board. Williams has question marks that could push him out of the top 10, but I'd be surprised if a guy with his ball skills slipped much further than that. #JimmySays: White has the Eagles trading all the way up to pick No. 13 with the Dolphins. I can certainly see the Eagles making a bold move like that, but it sure as hell won't be for a corner when they already have five young corners on the roster as it is. The Eagles are going to have an interesting offseason, with a lot of players no longer under contract. If they land Leonard Fournette via trade they can focus on adding a defensive player. #JimmySays: This will make the "Gotta get a linebacker!" folks happy. Personally, I think the value of the player here is fine, but the Eagles haven't drafted a linebacker in the first round since 1979. It's just not a position the Eagles value, past, present, and likely future. I nearly made a trade for the Eagles to go up a few picks to draft Dillard. It would be an easy move for Philadelphia since the team has two second-round picks. Instead, I kept the Eagles at No. 25 to take Little. He’s a little raw still, but his athleticism and size make him a natural at left tackle. #JimmySays: Offensive tackle is an interesting position for the Eagles. If Jason Peters returns, it'll be hard just to fit one on the roster with Peters and Lane Johnson starting, and Halapulivaati Vaitai and Jordan Mailata both locks to make the team in 2019. And even if Peters retires (or is released, or whatever), whether or not the Eagles prioritize the offensive tackle position in the draft will hinge on what they think about Jordan Mailata's prospects to be a long-term starter, beginning in 2020. Until Peters is gone, I don't think OT is even in the discussion in the first round in what isn't the best OT draft class. Jeffery Simmons wasn’t invited to the NFL Scouting Combine due to a violent incident that occurred between he and a woman many years ago. This is only the start of people finding out what happened with Simmons that day. But, in summary, it was an incident with his family that got violent and Simmons felt the need to protect his family. Since then, all reports say he’s been nothing but a model student and citizen. I can see a team like the Eagles and a coach like Doug Pederson taking a chance on Simmons. This would be a good spot for him in many ways. #JimmySays: Simmons is an outstanding player, who could wreak havoc next to Fletcher Cox on the interior of the Eagles' DL. I can't imagine him still being available at 25 if teams become comfortable with the aforementioned off-field incident, but if they don't, I agree that the Eagles would be a good landing spot for him. The Eagles had success their first time dipping their bucket into the Mississippi State iDL pool (Fletcher Cox). Why not go again? The Eagles’ defensive system under Jim Schwartz calls for chaos up front: the defensive line is designed to get into the backfield and make a mess of things. Putting Simmons between Fletcher Cox and Derek Barnett/Michael Bennett/Brandon Graham (Graham is a free agent) would certainly free up everyone on the line to make a mess of opposing backfields. There are a number of short and long-term concerns for the Eagles secondary on a defense that gave up the most passing yards in the NFC last season. A versatile defender with dynamic playmaking upside, Adderley would be a welcomed addition. Adderley’s range, ball skills, coverage awareness, processing skills, physicality and tackling ability are all plus traits and he checks a lot of boxes. Adderley was an absolute joy to study on film and is a first-round safety all day long, assuming he tests where I believe he will. #JimmySays: The fact that the Eagles gave up the most passing yards in the NFC last year is somewhat irrelevant, seeing as they suffered an absurd number of injuries in their secondary. Certainly, the Eagles' back end, when healthy, is projected to be far, faaaar better in 2019 even if they do nothing to improve it this offseason. I do like Adderly as a player, and while a safety makes sense with Rodney McLeod now playing in a contract year, the Eagles are not likely to bypass quality edge rushers in favor of a safety in the first round. It's just not what they do. Also, to quickly note, these Draft Network guys are on mock draft 6.0 already. Slow down, fellas. It's not even Valentine's Day yet. A few newsworthy events pertaining to the Eagles' defense have materialized since the last CMD a week ago: 1) Safety Rodney McLeod agreed to a restructured contract, freeing up cap space and ensuring stability in the Eagles' Safety corps, and 2) DE Chris Long, who most assumed was a goner, made remarks indicating he could be back next year. That's good news, because while the Eagles' defense was respectable last year (12th in NFL in PPG Allowed, 7th in Rushing YDS Allowed, 8th in league with 44 sacks), they rarely were game-changers. The defense suffered a sadistic amount of year-ending injuries which crippled the unit, but also gave some young guys in the secondary some valuable playing time. The fact that these emergency backups held Drew Brees and the Saints to 20 points in the playoffs proves that some hidden gems have been discovered. Assuming the guys on IR return (Derek Barnett, Jalen Mills, McLeod, etc), the Eagles' defense could once again become a weapon, providing they can find another good pass rusher. Rashan Gary is one of the most interesting prospects in this draft. Going to Michigan as the unanimous top recruit in his class, he was one of the most heralded D-Line prospects in recent history. While Gary was very good for the Wolverines, his on-field production didn't match the tremendous hype (9 sacks, 23 TFL in college career). Nevertheless, the ability, power, speed and raw tools are obvious. Gary's name is frequently included in "Top 5 Players" lists, and while I would be leery of taking him that high, he is a steal at #25. The thought here is that NFL coaches will be able to unlock his potential and turn him into a pass-rushing, run-stuffing force that can play up and down a 4-man front in multiple packages. His potential is off the charts. #JimmySays: Gary would indeed be a steal at 25. The Eagles need an upgrade at cornerback. In 2018, Williams collected two interceptions, 32 tackles and nine passes broken up. He had some problems against Alabama, giving up multiple first downs, a touchdown, and a longer completion on which Jerry Jeudy burned him with speed. Team sources have also said that the Georgia tape exposed Williams for being vastly overrated by the media. Some evaluators who like Williams see him as a late first-rounder and are concerned about his lack of speed. Williams broke out in 2017 with six interceptions, 11 passes broken up and 38 tackles. He showed good instincts, an ability to break on the ball, and impressive ball skills. One big problem for Williams (6-2, 175) is a very skinny frame that he needs to add a lot of weight to for the NFL. #JimmySays: Ah, NFL mock drafts, where one guy can have the Eagles trading up to 13 to draft a guy, and another can have that same guy falling to pick 25. 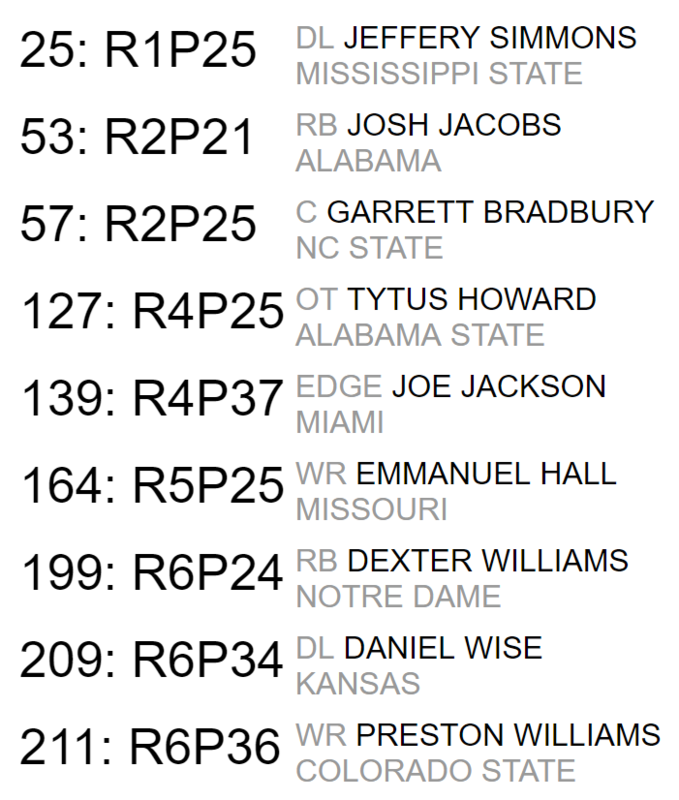 Just for the hell of it, I did a seven-round mock draft on Fanspeak's "On the Clock" draft simulator. Here's what I came up with.